The Beast's Lair: Dollywood Announces "Mystery Mine"
This was brought to my attention by my sister and after doing some research, I am pretty much completely pumped up about the current direction of Dollywood. First, a little history. . . I have always been a Dollywood supporter. I remember going to "Silver Dollar City" back in the day and riding my favorite ride at the time, "The Flooded Mine." My heart still hurts when I take the time to reflect on how they gutted the Flooded Mine for a new Log Flume themed ride. 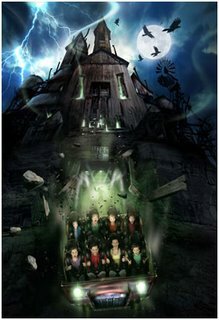 For those who don't remember, The Flooded Mine was a dark ride on water with great atmosphere and a terrific ending. I really miss that ride. However, everything changed for the better when my sister, Melissa (or Missy, my name for her since I was born), dragged me onto "The Blazing Fury" assuring me that "there are no drops on this ride." Well, there were drops, three in fact, and the last one was a pretty big one, at least when you are 7 years old. Nevertheless, I fell in love with the ride and both Dollywood and The Blazing Fury have forever been etched into my being as classics that are unbeatable. Recently, D-Wood has really stepped up into the big leagues with their "Thunderhead" wooden rollercoaster. This bad boy rivals any wooden coaster out there and it is simply a blast. Then, I read about this. . . The Mystery Mine. Heck yeah. I want to think that D-Wood engineers remember the beauty and power of the original "Flooded Mine" and wanted to bring a "mine" theme back in a big way. Whatever the case, this looks like the real deal. A dark, eerie mine with a haunted past that sends riders on 95 degree drops, 2 vertical lifts, heartline rolls and inversions. Over 17 million D-Wood is spending on this ride, making it the largest expansion project in the parks history. As you already know, I am super pumped about riding Expedition Everest in a few short days. WORD! Rex and I leave on the 24th for our Orlando run. I am excited about Everest. But I have an even deeper satisfaction for the guys over at the small little D-Wood park that are making some serious noise. Heh, I can beat that - I remember when Dollywood was Goldrush Junction, when I was very little. Well, through elementary school I guess. Then it was Silver Dollar City in junior and senior high - not sure when it became Dollywood, but sometime in college I guess. So I definitely remember the old Flooded Mine, which was my favorite ride - I don't remember many of the details, but I do recall thinking a few times in the years before they closed it that I could definitely give them a few pointers in how to spruce the theming up, specifically fixing the antiquated sound and lighting and improve the scenes. But it was still fun. I'm pumped about the new Mine ride. They're definitely moving in the right direction. Beast and/or Rex - do either of you remember the old Okeefenokee Swamp at Six Flags over Georgia (which is now the Plantation Manor or something). Just from the rememberd joy of childhood, that was my favorite ride of all time. Absolutely, the Okeefenokee Swamp was a classic "tunnel of love" dark ride where things seem fine until you get inside the "tunnel." I prefered that to the now Monster Plantation. Hey, I grew up in Missouri and there was a Silver Dollar City in the Branson area. Is that the one you're referring to? No, this particular Silver Dollar City is in Pigeon Forge, TN, and is now Dollywood. The one in Branson is still a Silver Dollar City I think and it actually has the orginal "The Blazing Fury" ride which in Branson is call "Fire in the Hole." One of my goals is to get out there and ride "Fire in the Hole." After a quick internet check, Silver Dollar City in Branson is, in fact, still going strong. And the "Fire in the Hole" coaster has been in operation since 1972, compared to "The Blazing Fury" which has been in operation since 1978. Beast, You ready to rent a "Yellow" V8 Mustang and make a road trip to Branson? P.S. Don't forget "The HULKSTER"